What is a Pyramyd Air gift card? Can I order a large number of gift cards at once? Help! My gift card order didn't arrive. I'm having trouble using my gift card to place an order. What am I doing wrong? What happens to the rest of my gift card if I don't use it all at once? PyramydAir.com gift cards can be used to buy almost any item sold on PyramydAir.com. You can buy gift cards for any amount between $5.00 and $1,000.00, and print your gift cards from home or send them by e-mail or physical mail anywhere in the world. If you've received a gift card and enter the claim code on an order we'll keep the balance in Your Account for use on future purchases. PyramydAir.com offers you multiple ordering options and gift card types so you can choose the one that's best for you. If you'd like to purchase a Pyramyd Air gift card while shopping for other items, you can add gift cards of selected dollar values to your Shopping Cart. Simply search for "Gift Card" in the Search field at the top of any PyramydAir.com page, click on the gift card offer you'd like to buy, and click the [ Add to Cart ] button. As with other gift card purchase options on PyramydAir.com, you cannot use Pyramyd Air gift cards to purchase new gift cards. When a gift card is in your Shopping Cart along with other items you wish to buy, any existing gift card balance on Your Account will only be applied to the purchase of eligible items and not to the gift card. You will need to provide a credit card, debit card, or other valid payment method to pay for the order if you have gift cards in your shopping cart. If you have trouble applying a gift card balance to an order, please try removing the gift cards you wish to buy from the order and purchase them separately with a valid payment method. When you order gift cards through the shopping cart, Standard Shipping is free. E-mail gift cards: Generally arrive within 1 hour of being ordered. Sure! $25, $50 and $100 gift cards can be purchased through the Shopping Cart. You can also order up to 100 custom value gift cards in a single order. See How do I order a gift card? above. If your gift card order doesn't arrive, please contact us. If you purchased a customized gift card that was sent via mail or e-mail and it doesn't arrive, you can follow the instructions below for resending your gift card. Some e-mail providers give users the option of blocking all e-mail messages that originate outside of their domain. You may want to check with your recipient first to make sure their e-mail is configured to accept e-mails from PyramydAir.com. First, locate your card number in the e-mail or paper gift card you received. I accidentally deleted my gift card. Can you send me another one? We'll contact you by e-mail once we have canceled the original gift card and issued a new one. Are you receiving an error message that says the gift card has already been redeemed? Once you've entered the claim code on our site, we'll keep the balance in your account for use on future purchases, and you don't need to enter the claim code again. To confirm that the funds are already on your account, check your current gift certificate balance through Your Account. If the funds don't show up there, you might have more than one PyramydAir.com account; please contact us. Once you've entered the claim code on our site, we'll keep the balance in your account for use on future purchases, so you don't need to enter the claim code again when you place your next order. Please be aware that the original expiration date applies to any unused funds. When you place your next order, make sure the box on the order form is checked that says "Apply gift card or promo funds?" If your order total is more than your gift card funds, you'll need to pay for the rest with a credit card. You should see the gift card funds reflected in the cost summary. If the funds don't show up there and your gift card hasn't expired, you might have more than one PyramydAir.com account; please contact us. Help! The gift card I ordered didn't arrive. 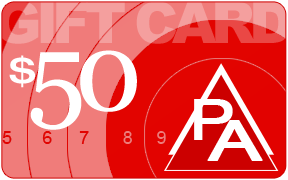 Gift Cards must be redeemed through the Pyramyd Air's retail Web site, www.pyramydair.com, toward the purchase of eligible products. Purchases are deducted from the Gift Card balance. Any unused balance will be placed in the recipient's Gift Card account when redeemed. If an order exceeds the amount of the Gift Card, the balance must be paid with a credit card or other available payment method. 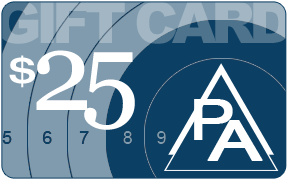 To view Gift Card balances, visit "Your Account" on Pyramyd Air. Gift Cards may not be redeemed for the purchase of products through in-store pickup, or any person or entity, except as indicated by these terms and conditions. Gift Cards cannot be reloaded, resold, transferred for value, redeemed for cash or applied to any other account, except to the extent required by law. 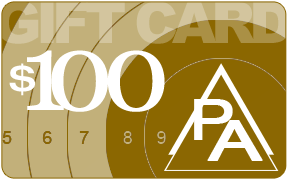 Unused Gift Card balances in an Pyramyd Air account may not be transferred. Bullseye Bucks will not be awarded purchasing Gift eCards. Gift Cards and their use on the Pyramyd Air Web site are subject to Pyramyd Air's general Conditions of Use and Privacy Notice. Pyramyd Air may provide Gift Card purchasers with information about the redemption status of Gift Cards. The risk of loss and title for Gift Cards pass to the purchaser upon our electronic transmission to the purchaser, recipient or delivery to the carrier, whichever is applicable. We are not responsible if a Gift Card is lost, stolen, destroyed or used without your permission. If you have any questions, please see Gift Card FAQ's. Pyramyd Air will have the right to close customer accounts and request alternative forms of payment if a fraudulently obtained Gift Card is redeemed and/or used to make purchases on the Pyramyd Air Web site. PYRAMYD AIR AND ITS AFFILIATES MAKE NO WARRANTIES, EXPRESS OR IMPLIED, WITH RESPECT TO GIFT eCARDS, INCLUDING WITHOUT LIMITATION, ANY EXPRESS OR IMPLIED WARRANTY OF MERCHANTABILITY OR FITNESS FOR A PARTICULAR PURPOSE. IN THE EVENT A GIFT eCARD CODE IS NON-FUNCTIONAL, YOUR SOLE REMEDY, AND OUR SOLE LIABILITY, SHALL BE THE REPLACEMENT OF SUCH GIFT eCARD. CERTAIN STATE LAWS DO NOT ALLOW LIMITATIONS ON IMPLIED WARRANTIES OR THE EXCLUSION OR LIMITATION OF CERTAIN DAMAGES. IF THESE LAWS APPLY TO YOU, SOME OR ALL OF THE ABOVE DISCLAIMERS, EXCLUSIONS, OR LIMITATIONS MAY NOT APPLY TO YOU, AND YOU MIGHT HAVE ADDITIONAL RIGHTS. Any dispute relating in any way to Pyramyd Air Gift Cards in which the aggregate total claim for relief sought on behalf of one or more parties exceeds $7,500 shall be adjudicated in any state or federal court in Cuyahoga County, Ohio, and you consent to exclusive jurisdiction and venue in such courts. When you purchase, receive or redeem a Pyramyd Air Gift Card, you agree that the laws of the State of Ohio, without regard to principles of conflict of laws, will govern these Gift Card terms and conditions. Pyramyd Air reserves the right to change these terms and conditions from time to time in its discretion. All terms and conditions are applicable to the extent permitted by law.